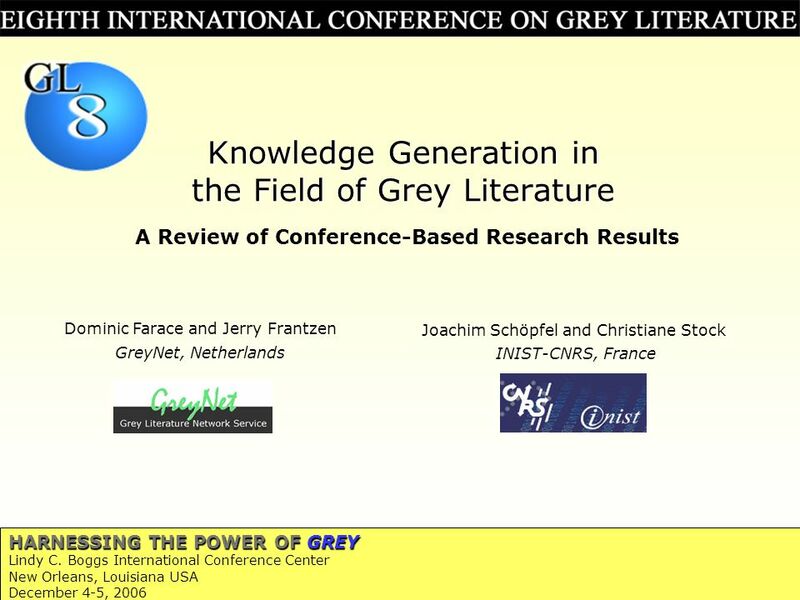 1 HARNESSING THE POWER OF GREY Lindy C. Boggs International Conference Center New Orleans, Louisiana USA December 4-5, 2006 Knowledge Generation in the. 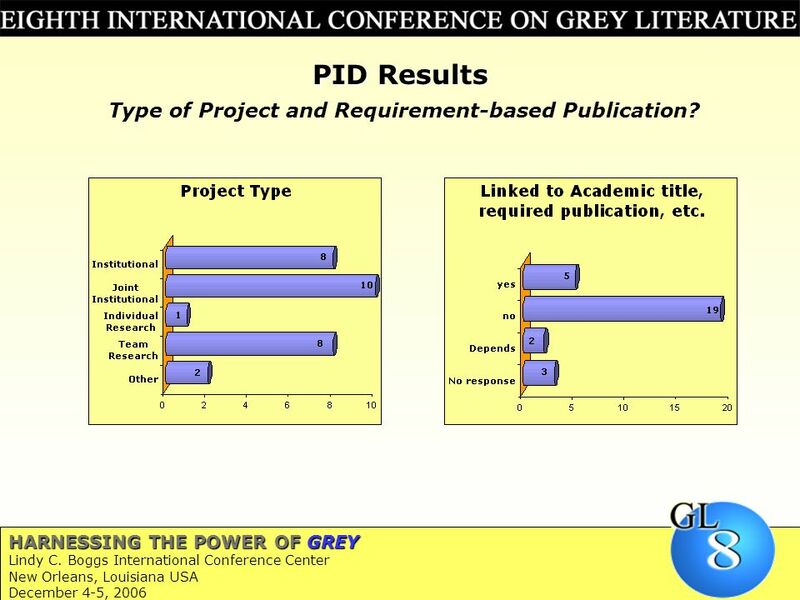 4 4 HARNESSING THE POWER OF GREY Lindy C. Boggs International Conference Center New Orleans, Louisiana USA December 4-5, 2006 PID Results Type of Project and Requirement-based Publication? 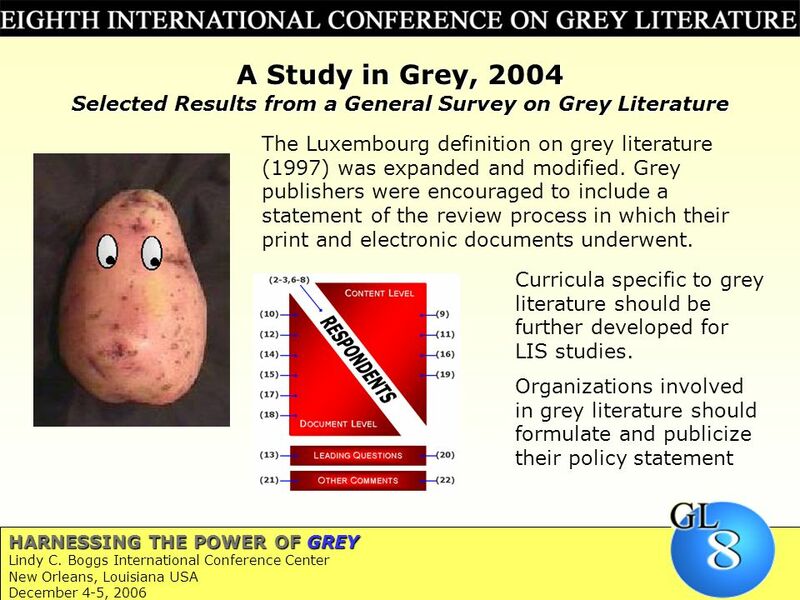 7 7 HARNESSING THE POWER OF GREY Lindy C. Boggs International Conference Center New Orleans, Louisiana USA December 4-5, 2006 A Study in Grey, 2004 Selected Results from a Review of the Literature At GL5 the work and careers of a number of 20 th Century pioneers in the field of grey literature were reviewed. A need to look at the direction GL would take in the 21st Century. 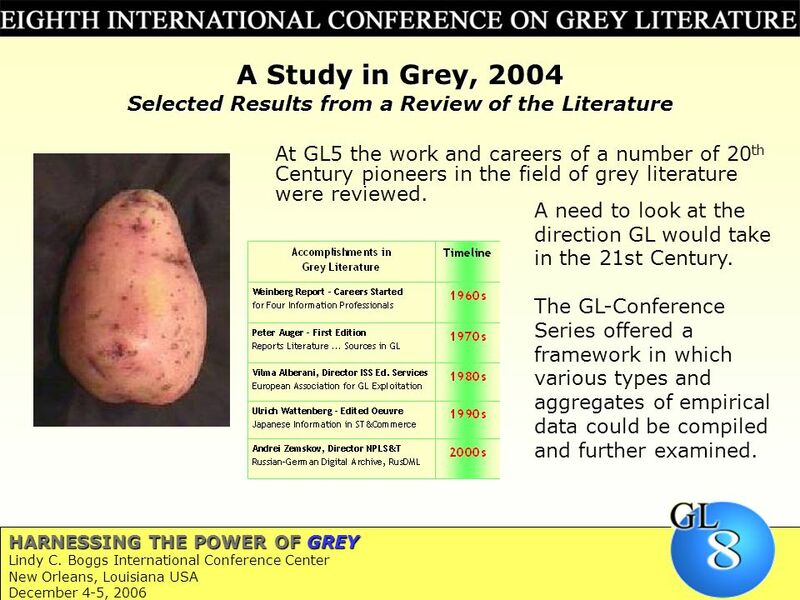 The GL-Conference Series offered a framework in which various types and aggregates of empirical data could be compiled and further examined. 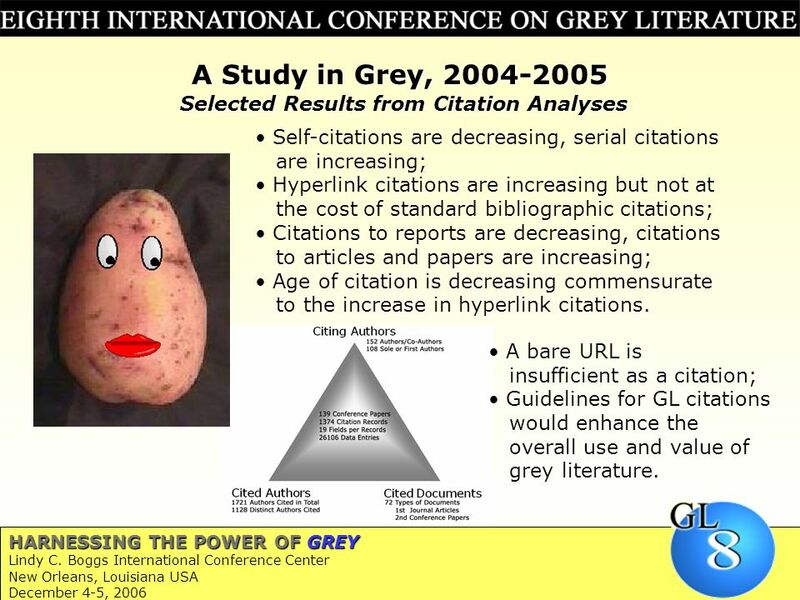 9 9 HARNESSING THE POWER OF GREY Lindy C. Boggs International Conference Center New Orleans, Louisiana USA December 4-5, 2006 A Study in Grey, 2004-2005 Selected Results from Citation Analyses Selected Results from Citation Analyses A bare URL is insufficient as a citation; Guidelines for GL citations would enhance the overall use and value of grey literature. Self-citations are decreasing, serial citations are increasing; Hyperlink citations are increasing but not at the cost of standard bibliographic citations; Citations to reports are decreasing, citations to articles and papers are increasing; Age of citation is decreasing commensurate to the increase in hyperlink citations. 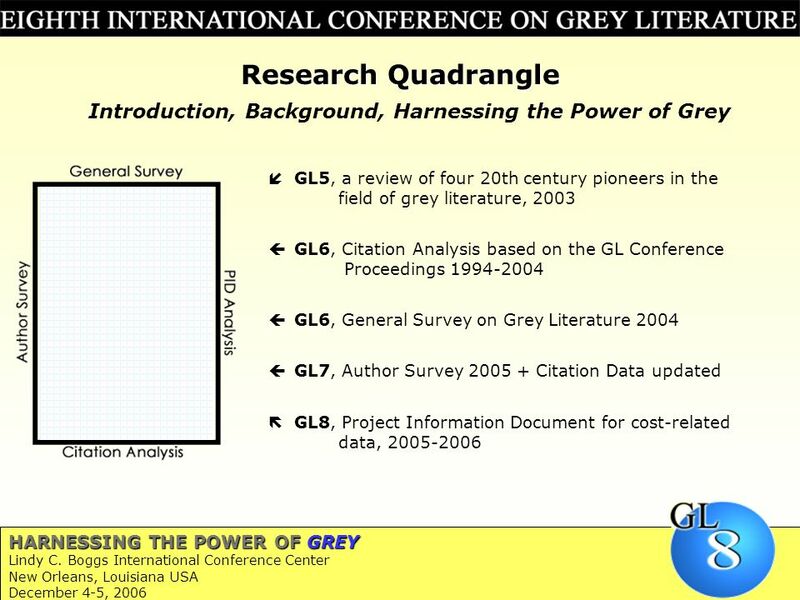 10 10 HARNESSING THE POWER OF GREY Lindy C. Boggs International Conference Center New Orleans, Louisiana USA December 4-5, 2006 A Study in Grey, 2005 Selected Results from a GL-Author Survey Europe and North America account for 87% of research on grey literature; 55% hold that a Citation Style for GL would be of benefit to them; 49% have published via a commercial publisher; 59% have published on other topics than GL; 66% have a positive view on Open Access; 29% have a positive but qualified standpoint on Open Access. 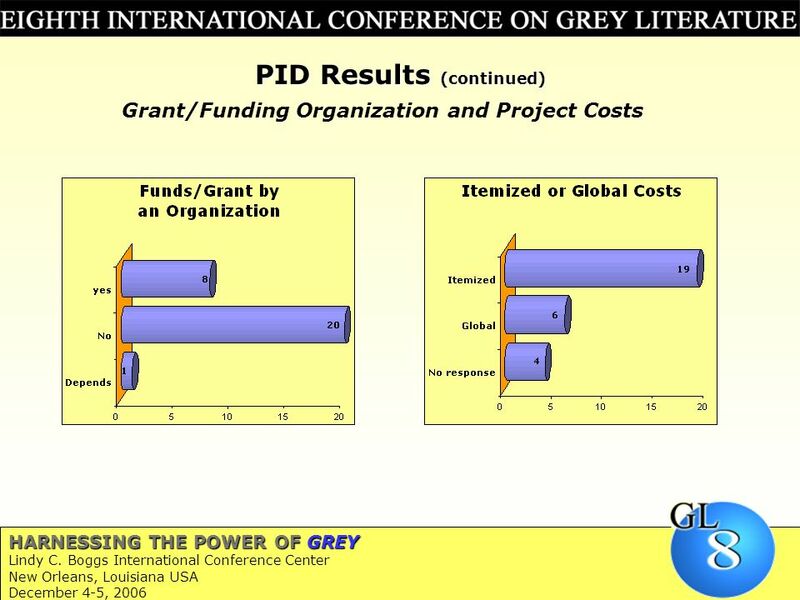 12 12 HARNESSING THE POWER OF GREY Lindy C. Boggs International Conference Center New Orleans, Louisiana USA December 4-5, 2006 Conclusions and Recommendations A typical figure in grey? 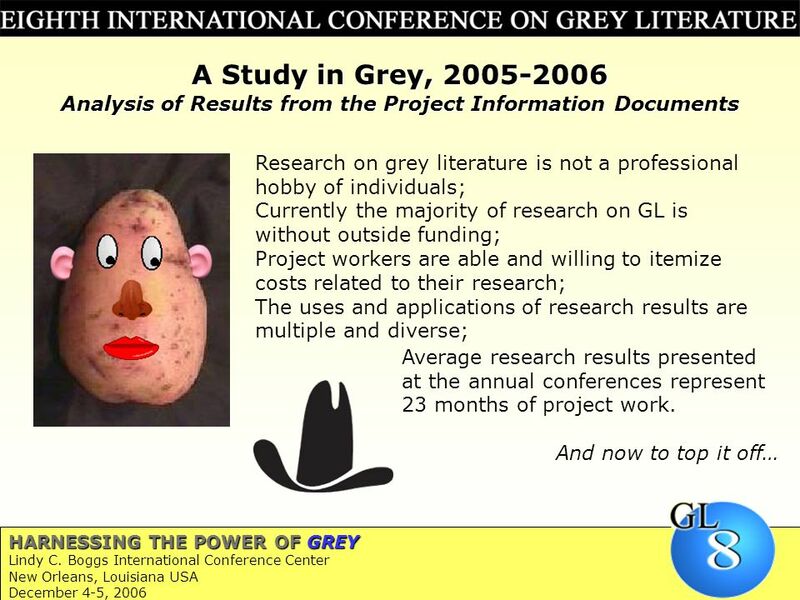 In our attempt to Harness the Power of Grey, our team has introduced over the past four years a number of methods for gathering, compiling, comparing, and analysing research results within the GL-Conference Series. 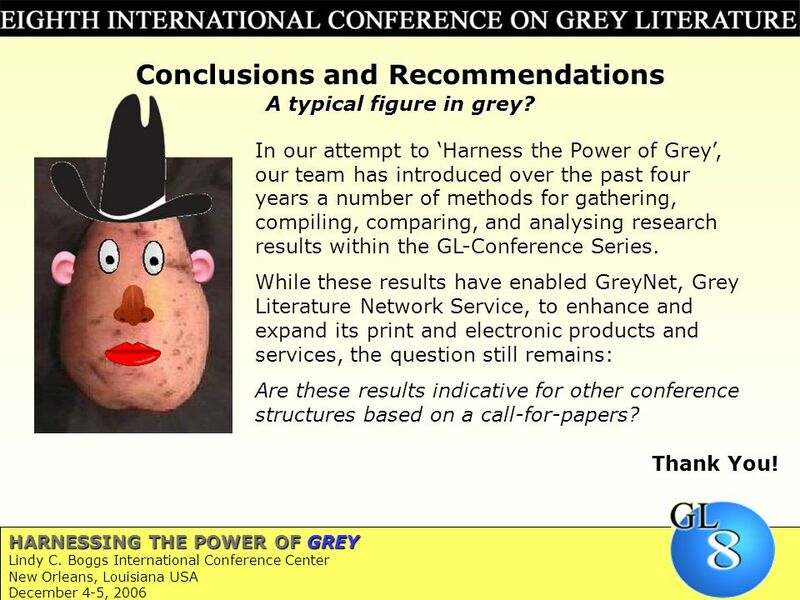 While these results have enabled GreyNet, Grey Literature Network Service, to enhance and expand its print and electronic products and services, the question still remains: Are these results indicative for other conference structures based on a call-for-papers? Thank You! 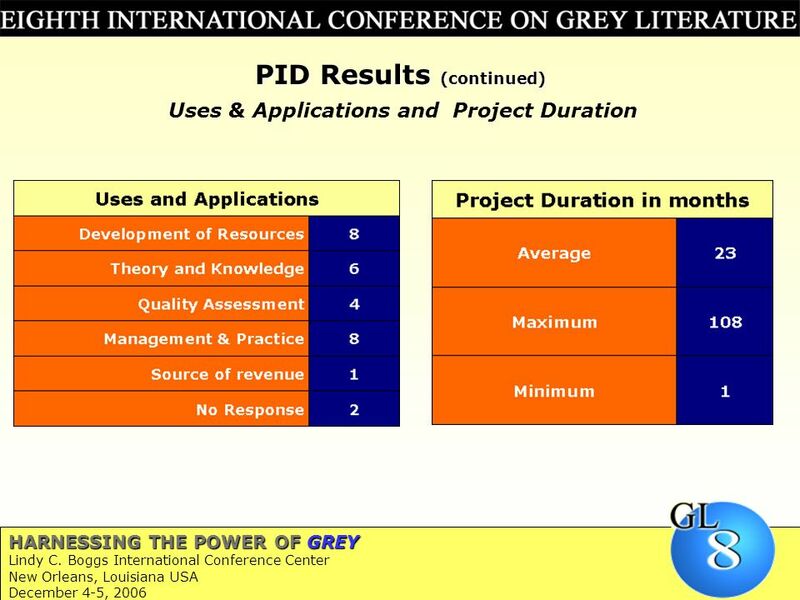 Download ppt "1 HARNESSING THE POWER OF GREY Lindy C. Boggs International Conference Center New Orleans, Louisiana USA December 4-5, 2006 Knowledge Generation in the." HARNESSING THE POWER OF GREY Lindy C. Boggs International Conference Center New Orleans, Louisiana USA December 4-5, 2006 Sponsor Invitation From: T ext. WORK ON GREY IN PROGRESS The New York Academy of Medicine NYAM Conference Center 6-7 December 2004 Grey Literature Survey 2004 A Research Project Tracking. 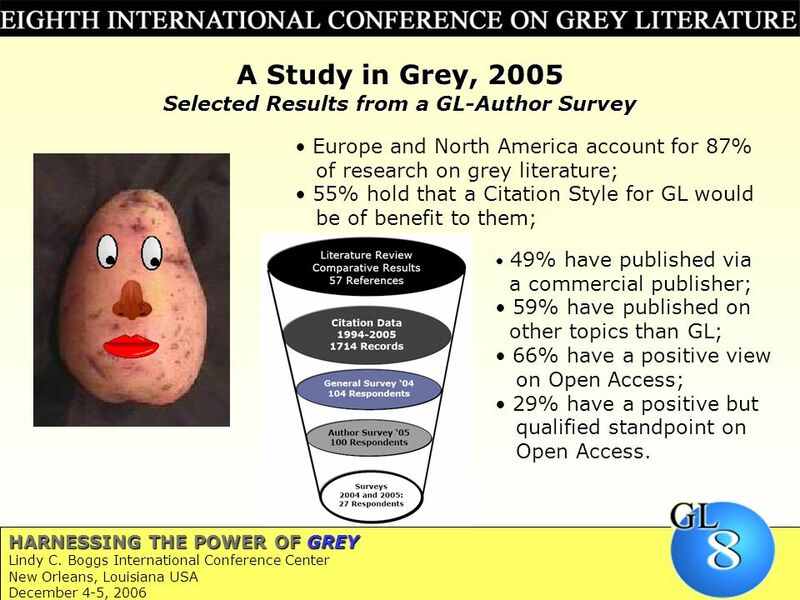 New Orleans, 4-5 December 2006 – GL8 Round Table: Quality Assessment of Grey Literature Awareness and empowerment in document production and distribution. 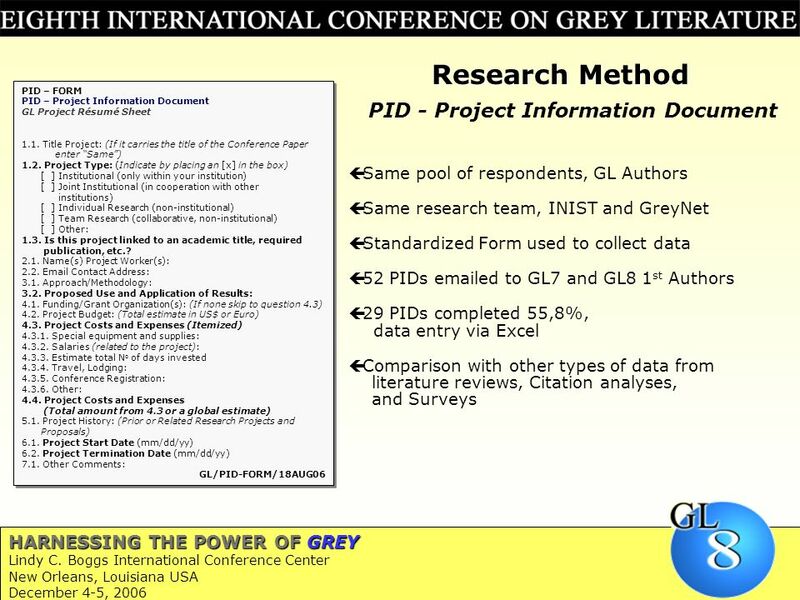 WORK ON GREY IN PROGRESS The New York Academy of Medicine NYAM Conference Center 6-7 December 2004 Citation Analysis and Grey Literature: Stakeholders. Louisiana Coastal Grey Literature Project Gina Costello Digital Services Librarian Louisiana State University Libraries.